Not a great week..But CEO Job Advertised now! It began badly, as I had walked 10 miles in 3 hours on the Sussex Downs in practice for the Guildford Y to Redhill Y 26 mile charity walk on 23 March. So it was fast time, but from nowhere I injured my back muscles ..don't know how. Then under pressure from my GP who I hadn't seen for some 8 years I had to go to see a hospital consultant about a lump on my head which resulted in a biopsy being taken and stitches, so I now look like an extra in a Hammer House of Horror Movie. The back is now better...only muscular...we'll draw a veil over the rest. And Manchester Utd lost ...again. In consequence of the hospital visit I had to miss a social enterprise board meeting on Tuesday which was unavoidable, but a pity. The important point this week is that my CEO job is advertised today (see website ) with a closing date of 21 March. You should apply ..great job..and lovely team to work with! Ran a workshop in West Sussex on Wednesday - "Preparing for commissioning" - felt a bit deja vu as West Sussex CC have now decided to go down the commissioning for outcomes path. The sector is very narrowly focused on small parish areas...I would do a lot of work on market making if I was WSCC. Off to three meetings in Leatherhead on Friday with Menzies the accountants, with B Free Youth Cafe (about apprentices for the CiC) and about mental health contracts in the afternoon. Hoping for better things next week. I have been hugely impressed by the report of the Demos think tank called " Introducing Generation Citizen", and it is a fascinating study into the values , attitudes and behaviours of today's young people. It traces the history of generational change from the post-war Baby boomers (like me) through to Generation X( those born roughly 1960-80) and Generation Y (the "Me generation", born roughly 1980-2000) and hence to this first generation who are totally conversant with technology. The report will be on our website shortly. The report dispels some myths, and finds for example that young people now drink less and volunteer much more than any generation preceding. It is easy to be cynical of course - this is still the age of austerity, and maybe volunteering IS a necessary pathway to work, and building UCAS points, BUT it is still socially valuable.The report also emphasises the importance of ethical values to young people and how they engage in global issues(environmental, animal welfare, energy, fairtrade) but NOT traditional party politics from which they feel alienated. This brings me to a second point, namely the extent of what the Government calls "Youth Social Action". I will be writing more about this in the next "Young Surrey ; Strategic review I am about to start working on for publication in late April,. However it is clear that there is a sea- change in the expectations of today's young people about social action. We are now planning a major conference about this in November. 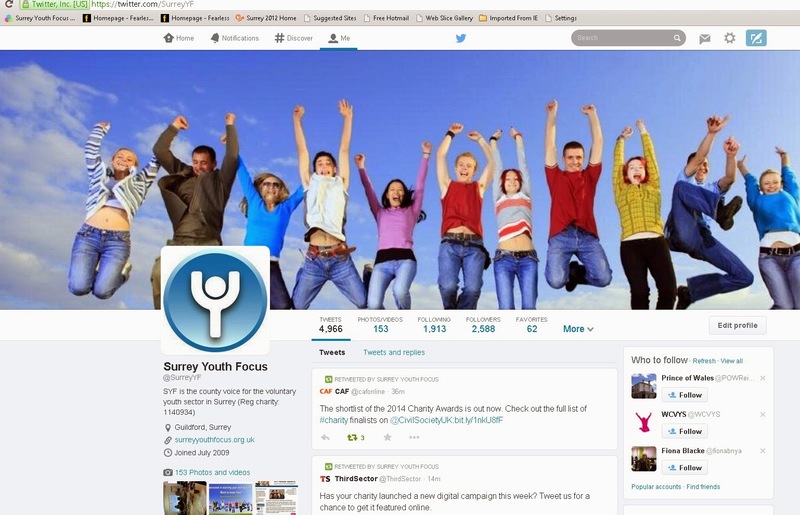 Which may seem odd as I retire at the end of August and my job as CEO of Surrey Youth Focus will be advertised at the end of next week with a closing date of 21 March and interviews being held on 8 April. (I am not involved in this process at all), It is a GREAT job..more later. We are progressing the Woking Youth Arts Centre social enterprise with a view to take-over from 1 April, but there is a lot of detail to sort out yet. I'm running a workshop on "Preparing for commissioning " in West Sussex next week - part of our legacy funding and obligations from WSCVYS. The "How to " set up in self- employment workhop went well last week at the Woking Business incubation centre and we see that nationally there is a big growth in self-employment particularly amongst women. "Surrey Youth Focus are exceptional"
supporting innovation by local authorities ie the offloading of internal services into Mutuals, Social enterprises and Local Authority Trading Companies hence my comment about the blurring of the distinctions between the public/private/charity sector. Part of being exceptional is that we are constantly innovative and I was really pleased to have a pre-meeting with our CommUniLAB project manager this morning together with one of our Trustees to begin planning the project. This will be a game-changing success for SYF. Another innovation is setting up our second social enterprise to take over the management of Woking Youth Arts centre. There is a huge amount of time driven work to get this sorted for us to take over the property from 1April...we need cleaning/building maintenance contractor , change the locks, sort entry codes etc. I had an encouraging meeting with Surrey CC's Cabinet Member, and Associate Cabinet member together with the County Councillor for Knaphill. They wanted to be re-assured about our plans for the WYAC and in particular that we would not be disadvantaging Peer Productions. I was able to share the very positive plans we have for marketing more activities in the building. Met with YES+ on Wednesday to plan the delivery of a 2 day workshop delivered by them to youth workers from the Youth Consortium about the early identification of indicators that might lead to ant-social or criminal behaviour. Project funded by the Police and Crime Commissioner. We're hoping to pitch the intelligent CCTV software to Surrey Police on behalf of our first social enterprise, but understandably Surrey Police are pre-occupied with flooding issues at the moment. Just been asked this morning to take on a funded project to engage with young people about health issues...more work..more income..exceptional! I have said many times that the cuts being experienced by the public sector will continue, and will not be replaced even when sustainable growth recurs, as it is beginning to now.The practical consequence is that the public - private - charity sectors need to recognise their interdependencies and ensure their contributions as partners. Our CommUniLAB project is predicated on this belief. This has been a very good week for illustrating the value of partnership. On Monday we had a long meeting at Woking Youth Arts Centre with our prospective users - Peer Productions, Insound an Poprox (the latter two help young people play and record music). These were very positive meetings and on Tuesday evening my Trustee Board gave the go ahead to us taking on the 5 year lease from Surrey CC for us to manage the WYAC through a separate social enterprise.The aim is to increase lettings and make it into a vibrant, well used youth arts centre. I now have to move quickly to get this second social enterprise set up. Then on Tuesday I was at a meeting of the 14-19 Strategy Board at which Surrey CC colleagues gave a presentation of a superb analysis of the needs of young people - both statistical but also informed by the views of young people through surveys and focus groups. The big theme is about encouraging the employability of young people. Our own "How to " set up in business workshops are now "sold out" - a good sign. I was at County Hall on Wednesday with Surrey CC's CEO and other colleagues about the planning of another workshop with Surrey Charity Chief Executives' Group. SCC had drawn out some principles of partnership/collaborative working deriving from the first workshop last October, and we agreed to use the next workshop to move on from principles to practices and on to behaviours. This is potentially very powerful, ground breaking stuff in the relationship between Surrey CC and the sector. I am getting closer to being able to start on the "Young Surrey Strategic Review 2014-15" the theme of which will be about changes in society and that whilst young people do need to be employable they also need to understand the very rapid global changes and their consequences. I am very struck by the way young people are disenfranchised from political power/influence by not voting, whereas my "baby boomer" generation has always voted, and the political consequences are evident. SO there is a theme about young people as citizens, and the need for resilience adaptability , and real experiences (not just "virtual living"). Surrey Young Carers are doing interesting work on this. Car wouldn't start yesterday , so missed a meeting , and still dodgy today- goes in to garage on Monday. Church meeting at home last Wed. evening about setting up a food bank.... I was right about the wrong selections/use of the England bench last week, though great match against France. Murrayfield mudbath tomorrow...I have a very Scottish Chairman now, so must be careful what I say...so happy birthday to Matilda (age 3) on Sunday!"